將樂譜插入樂譜現在更容易，更直觀。只要添加一個，Magnetic Layout 會自動重新定位其餘部分，以便與前面的註釋相符合 - 無需手動修正。以前所未有的速度創建易讀的樂譜。此外，您現在可以在分數中水平移動休息和筆記. - Opening older scores in 8.7.2 that contain any of the barlines in the second list above now open with a ‘Split multirest’ above them in each part. This retains the layout of the score, and also gives you a useful visual indicator to show why the multirest is splitting. To snap this back into a single multirest, simply select the split multirest and tap delete. - Sibelius 8.7 introduces a set of new buttons in the Ribbon interface that provides you with integrated controls for sharing and managing your scores. When you click Share, your score is sent to the cloud for processing and a link to your score is automatically copied to your clipboard—and that’s it! No more exporting separate .html and .sib files, installing a plug-in, restarting your browser or even finding a computer with a browser that’ll work. 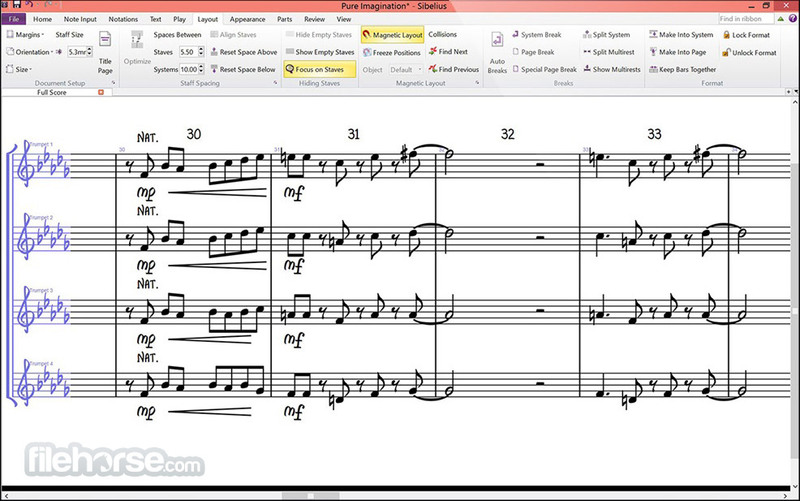 Scores shared using Sibelius | Cloud Sharing will work in any browser, on any device. - How does it work? When you press Share, Sibelius sends the score to your cloud account on Avid’s MediaCentral Platform (running on Microsoft Azure), which then starts processing it. The first thing that comes back is the URL to be shared. By the time you go to that URL, there’ll be little or no wait until the score has been rendered by our Cloud Publishing engine. The larger and longer your score is, the longer you’ll have to wait for it to be processed. As you can see, the dropdown presents additional options to embed code into web pages and blogs (more on this later), and the option to quickly stop sharing the score. Clicking Stop sharing stops scores from being viewed online immediately. You can share the score again, but clicking Share again will generate a new sharing URL. - What if you want to make changes to the score and share those? No problem! Pushing changes is simple. Once you’re ready to update a score that has already been shared, simply make the edits and click the Push button. You will be asked if you want to save changes to the score and push up the latest version. There’s no need to re-share the score, as the existing URL will continue to be used for that score. To see the changes reflected in the Viewer, simply refresh the page in your browser and it will automatically display the updated score. This eliminates the cumbersome workflow of exporting new pdf’s and mp3’s every time you edit your score, and significantly streamlines essential reviewing and collaboration workflows that are the lifeblood of most composers and arrangers. - Sibelius | Cloud Sharing also includes a new Dashboard for managing your shared scores. The Dashboard lists all the scores you’ve previously shared, allowing you to sort, search for, and manage whether a score is shared or not. It’s also extremely useful for getting a score’s shared URL without having to open it again in Sibelius. - To share a score on a social media site, you simply paste in the sharing URL you are given by Sibelius. When posting into Twitter, Facebook, WhatsApp, Skype, and other media sites and chat apps, you’ll see a nice preview of the music embedded directly in the post. This is drawn from the metadata from the Score Info dialog in Sibelius which we’ve made available as part of the Viewer. - Sharing URL’s is obviously a great way to share your music, but for those of you who’d like to showcase your music on websites, or even build interactive learning resources, Sibelius helps you do this as well. Either from the Dashboard or from the Share dropdown, Sibelius provides you with embed code that you can use to easily add your score for these applications. It looks something like this: Simply insert this code into your html page and the music appears when the page is rendered. We’ve tested several sites including WordPress, Canvas, and Atlassian, and they all work as expected. - The sounds you hear are an MP3 we generate in the cloud when processing the score. 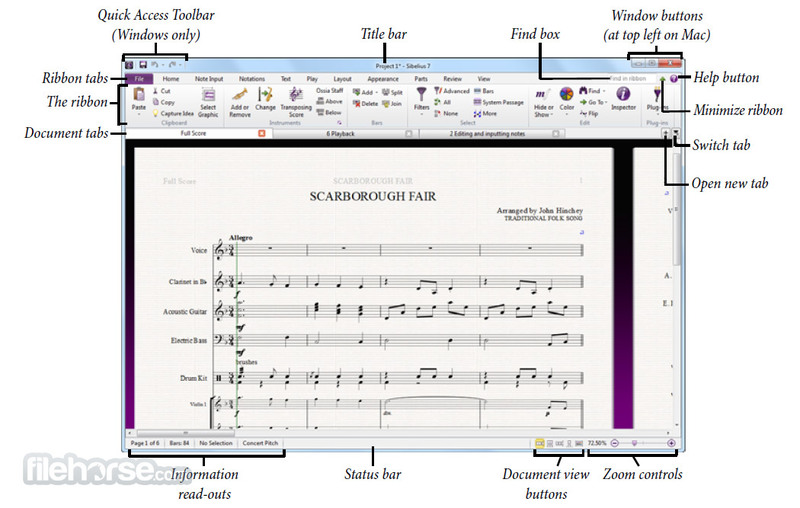 Our Cloud Publishing engine is a “headless” version of Sibelius that processes and renders the score, much like the one you have in Sibelius, along with an optimized version of the Sibelius Sounds library. As we need to quickly load this library in the cloud, these are the exact same sounds that are used in Sibelius, but with stripped down velocity layers and samples spread across multiple notes. The good news it that this optimized sound library retains nearly all the instruments and playing articulations, resulting in a very close rendition of what you’d hear with the full Sibelius Sounds library in Sibelius. This is a significant improvement over the Scorch plug-in, which relied on local onboard MIDI sounds. - What you’ll also notice is that your shared scores look just like they do in Sibelius thanks again to the Cloud Publishing engine. This means that anyone reviewing your score will see it just as you intended, with superior resolution as you zoom in and out.